Monadnock Menus on the radio! Alex and Denise Meadows, one of our MM champions from Keene, visited Luca Paris on his radio show two weeks ago. We discussed MM, Denise’s amazing MM-inspired recipes, the Keene Housing Buying Club, and rhubarb syrup seltzer water. Listen to the podcast of the show here! We are on track to start up our new Friday route through Keene, Peterborough, Winchester, Richmond, Fitzwilliam, Jaffrey and Rindge in early July. The Wednesday delivery won’t change at all, but buyers on the Keene-Peterborough corridor will soon have the option of ordering for either Wednesday OR Friday delivery. Know any chefs south of Keene that could benefit from Monadnock Menus? 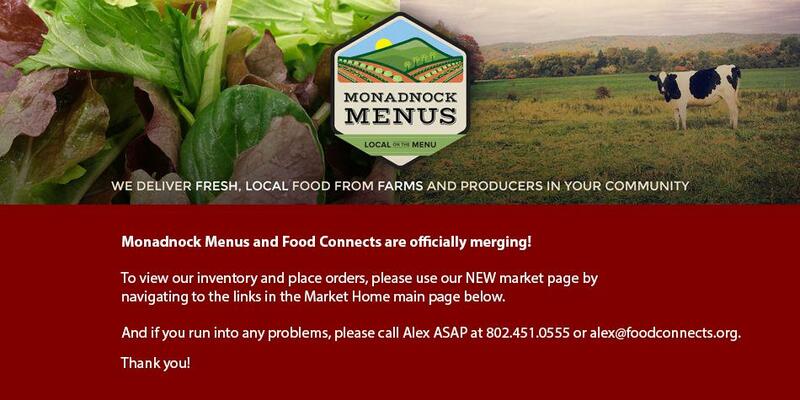 Tell them about the new route, and direct them to www.monadnockmenus.org! Archway Farm is a small family farm located in West Keene, right next to Stonewall Farm, and only 3 miles from downtown Keene. Our focus is exclusively on raising pigs, in an ethical, sustainable, and affordable manner. We are a farrow-to-finish operation selling sausage to wholesale accounts, as well as custom hogs, piglets, and breeding stock. All our pigs live continuously on pasture with access to shelter as the season dictates. During the warmer months we rotate pastures and plant forage crops so the pigs always have something new to root for. We feed our pigs GMO free grain grown and milled in Massachusetts, supplemented with fruits & vegetables that the Community Kitchen cannot use and wholesome day-old bread from a local bakery. Stonewall Farm was established in 1994 as a non-profit farm with an educational mission. The farm operates a certified organic dairy herd of Holsteins and Brown Swiss cows. Our milk has won awards for its consistently high milk quality and is a designated NH Dairy of Distinction. The milk is mostly sold to Organic Valley but we make an artisan raw milk Gouda cheese at the farm as well as plain, vanilla and maple yogurt (whole milk product). We also grow a variety of vegetables, herbs and cut flowers grown in our fields and greenhouses. We have Pick Your Own gardens and this season we will be growing transplants. Special orders can be taken for produce items as well. We also make maple syrup at the farm in our sugar house. The farm is free and open to the farm year round and is also a great venue to host business events, retreats, weddings, family celebrations, trainings and more! Our farm was established in 2012 when we purchased our home and 10 wonderful acres. We have strived hard to create an environment that we are proud to have our animals live their lives in. We are continually working on new ways to improve the farm and the rewards far out way the long hours :) We invite people to stop on by and meet the ducks and see our operation. Or check our facebook page for the latest updates! Fresh Free Range Duck Eggs!!!! Our duck flock is a mix of Indian Runner, Khaki Campbells, and Golden 300's. Our focus is on giving the animals a great quality of life where they are allowed to roam and explore while helping manage the bug and slug population. A variety of green, mostly arugula, mixed with baby kale, mustard greens and tot soi. Fresh baby beet greens, large or small quantities available.